MOORESVILLE, N.C. (April 8, 2019) – Former NASCAR drivers Blake Koch and Dale Earnhardt Jr. today announced a new partnership in FilterTime®, a company that provides homeowners and business owners an easy and affordable path to receiving and replacing air filters. The brainchild of Koch, FilterTime® is a subscription-based service that delivers customized air filters straight to the customer, essentially removing the arduous planning, shopping and hassle of air-filter replacement. To get started, FilterTime® customers simply log on to FilterTime.com to complete a one-time process of choosing their filters and setting their delivery schedule. They’ll begin receiving new filters every one, two or three months, depending on their preference and average life cycle of a filter. Shipping is free. Koch, who had 213 starts in the NASCAR Xfinity Series and six starts in the NASCAR Cup Series from 2009-17, became passionate about this new business endeavor shortly after his racing career. It was Koch’s passion and strategy that became interesting to Earnhardt, already an established business owner with JR Motorsports, Whisky River, Dirty Mo Media, and his automotive dealerships. Earnhardt retired from full-time racing in 2017 after 20 years in NASCAR’s top two touring series, a successful stretch that included 50 victories, two Daytona 500 wins and 15 consecutive Most Popular Driver awards. In approaching Earnhardt with the idea, Koch gained a partner whose reach will immediately impact the growth of the company as well as its potential reach among consumers. 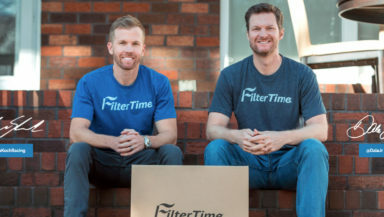 Formed in 2018 by former NASCAR driver Blake Koch with partner Dale Earnhardt Jr., FilterTime® offers a subscription-based air filter-replacement service for discerning homeowners. FilterTime® allows its subscribers to take control of their air-filter needs and never miss a replacement by shipping the products directly to the homeowner at no additional cost. The filters are made to order in partnership with NC Filtration of Belmont, N.C. and assembled, packaged and shipped anywhere in the country.